We humans are still in the cusp of winter and spring, but in the natural world, spring has been coming on strong, underneath the ice and snow in New England and most of the eastern seaboard. The signs of spring are everywhere. It began for me in the middle of February when my neighbors painted flowers on the ice banks bordering their driveway. It gave hope that eventually winter would end. Then, even in the midst of more snowstorms in New England, I began to hear the chickadees, always the lion-hearted ones, willing to stick around through it all. Soon after, I began to hear crows. That same day, my dog Ebony (Ebbie) and I were walking down one of our favorite dead-end dirt roads. I was thinking of what I wanted to do to initiate this sacred homestead I am stewarding now in Buckland MA. Three crows flew nearby. I do some pretty good crow-speak, and when they heard me answer them, they flew out of the trees to see who was engaging them. (One crow, sorrow; two crows, mirth; three crows, a wedding … ) Hhmmm, what energies are marrying each other, I asked. 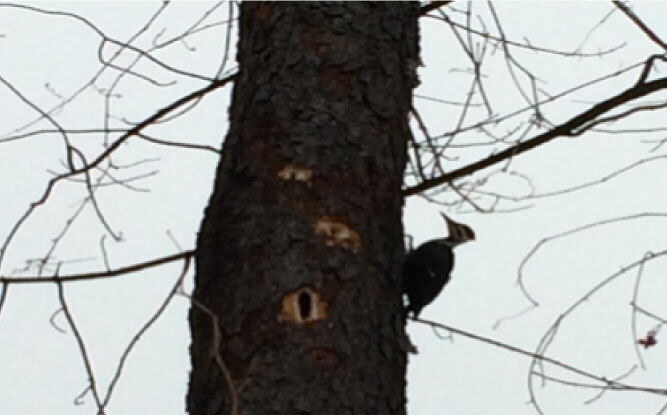 A few steps further on, a Pileated woodpecker was drumming right above my head. “What is your message for me, dear friend who taps out the heartbeat of the Mother, the pulse of Gaia? “My tap – tap – tap shakes you out of your winter doldrums and snaps you to attention, does it not? Paying attention is sometimes very difficult to do in this Age of Distraction; however, as in the natural world where creatures would not live very long if they were not attentive to all that surrounds them, so too does attentiveness give birth to, and increase awareness. In each new situation or context, take a moment to open your eyes, and your other senses to notice where you are, what you are doing and why, and how you feel. It will help you to know yourself, which is the precursor to loving yourself. When you step upon the forest trail, be alert to the life that surrounds you. Not just on the trail, but everywhere; life is everywhere. Paying attention will bring you into the moment you are in, and the value of being in the moment cannot be over-estimated. Why? Because your whole life exists in the moment you are in. The past is gone and the present is shaping your future moments. As a human, if you knew how long you were going to live, wouldn’t your perspective change? Would you let people know that you love them? Seek or enact more fully, your life’s purposefulness? Enjoy each moment more thoroughly? Tap – tap – tap. Why not live that way now? This Friday at 6:45 pm EDT, I’ll be drumming out the last vestiges of winter on this sacred land, honoring the Directions and the Elements, then drumming in a celebration of life in myself, all beings, Mother Earth, and all the Universe(s). What will you be doing?